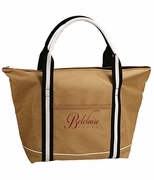 Looking for a spa tote, resort or eco-friendly tote bag. This jute tote with trim will work every time. Accented with rope handles.